"When I first saw 12.81 come up, I just thought, 'What? What is this?’ I was in complete shock. I just couldn’t believe that 12.81 popped up on the board. And then they rounded it to 12.80, and I just started screaming. I was just in complete shock. 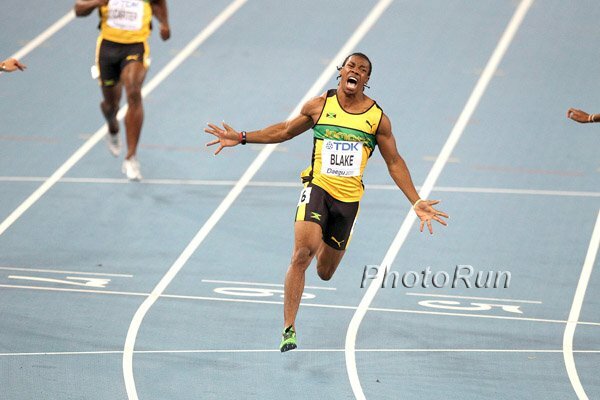 I just couldn’t believe that I ran that fast." 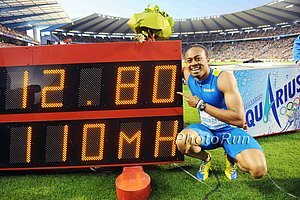 - Aries Merritt on his 12.80 world record in the hurdles Friday in Brussels. Race recap with video here, full meet recap here. Centro: lane 3 is tough way to do it, watch out for the lane 4 hurdle! Daily runners: how much/often do you typically drink/smoke? Rieti Preview This meet is usually a distance runner's paradise. This year the throws may highlight but there is some great distance action. 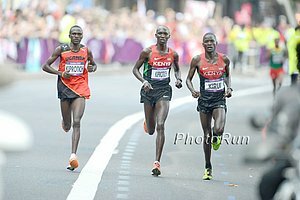 Savinova vs Francine Nyonsaba in 800, Ezekiel Kemboi in 3000m, Makhloufi in 800, Kiplagat in 1500, Cheruiyot in 3000. 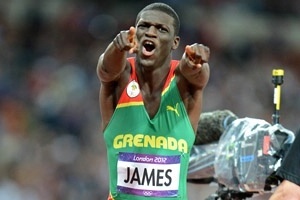 Jelimo run for 2nd place? wtf? 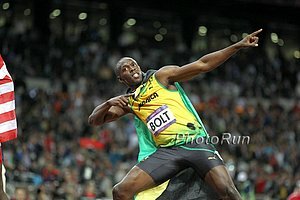 Bolt Throwing His Spikes Into the Crowd??? Merritt 12.80! The world record is gone! Oscar P Says Even Though He Could Compete In Blades Up To 9cm Taller, He Never Would Because He Wants To Know He's Won By "Hard Work And Talent" "I don't think every blade should be the same height, but I think it should be in relation to your body. For the sport to evolve and be taken seriously it has to happen." Sep. 16: Star-Studded Field For RnR Philadelphia Half Marathon Includes Olympic 5,000 Champ Meseret Defar, NYC Champ Firehiwot Dado, & Boston Champ Sharon Cherop Ethiopian record-holder Mare Dibaba NYC runner-up Buzunesh Deba also in field. Sep. 30: Olympic Bronze Medallist Tariku Bekele Will Make His Half Marathon Debut In Lisbon He'll be up against former World Half Marathon champ and three time London Marathon winner Martin Lel. NYC: RW Brief Chat With Trials 11th Placer & 2:12 Runner Ryan Vail, Who Will Run His 2nd Marathon At NYC He says he thinks German Fernandez can break 13:00 in the 5k next year. NYRR Catches Up With Scotty Bauhs In His Buildup To His Marathon Debut At NYC He talks about the surprise of losing his shoe sponsor even after qualifying for the 2011 World Championships. This Weekend: IAAF Preview Of IAU 24-Hour World Championships How far do these athletes run in a day? The last men's winner ran 170 miles in 24 hours (8:28 pace). The top woman has ran 158.5 (9:05 pace). 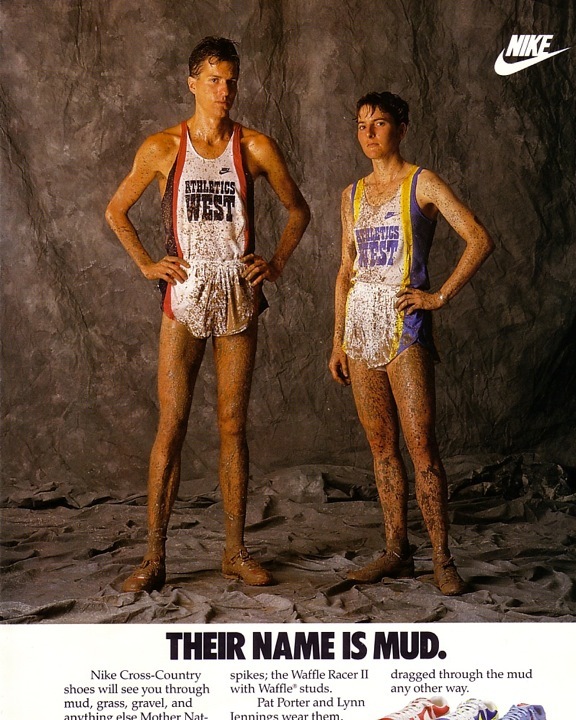 What's crazy is they run this on a 1,554m looped course. Interesting: Pistorius Was Actually Accused Of Having Blades That Were Too Long When He Won The 100 In His Paralympic Debut In Athens 2004 After losing to him in the 100 final, American single amputee Marlon Shirley asked questions about Pistorius' blades. South Africa Officials Reignite Blade Length Controversey And Are Requesting The IPC Launch An Investigation They think Pistorius' rivals are changing the height of their blades between the heads and finals (which is illegal). The IPC admitted that even though this is a rule, it's not something they actually check for. Oscar P Is Not The Only Paralympian Concerned Over The Blade Length Issue American Jerome Singleton and other single-leg amputees are concerned that double-amputees are allowed too much of a range with their blade height and also that they are gaining an unfair advantage by switching between longer blades for the 200m and shorter blades for the 100m. Pistorius Gets Revenge Over Alan Oliveira As He Holds Him Off On Anchor Leg Of 4 X 100 To Give SA The Paralympic Gold And New WR The two athletes Pistorius has complained about (Oliveira for Brazil and American Blake Leeper) were both on the anchor and took 2nd and 3rd. However, both of their teams ended up getting DQed anyway for handoff violations. NASA Scientist Jerome Singleton Wants To Beat Oscar P In The Paralympic 100m Final He's a smart guy and says that "amputee sprinting" can be "a multi-billion-dollar industry." Bethany Woodward Taks Silver Medal For GB In T37 200 Race For Athletes With Cerebral Palsy (CP) She explained that holding form with CP is a constant challenge: "It's like a brick wall you have to break through to get it done. The CP [cerebral palsy] side is lazy and, it's a constant battle to push through that and say actually, 'No you are going to do something great here.' I was going 'Come on! Push it' and my body listened." Rovereto Distance Results: Jenny Simpson Gets 2nd In 1,500 With 4:04.07 As Kenyans Mary Kuria (4:03.18) And Eunice Sum (4:05.85) Take 1-3 Hayle Ibrahimov Aze won the 5,000 in 13:11.34 as Andrew Bumbalough was 2nd (13:28.34), Elliott Heath was 10th (13:44.05) and Bobby Curtis was 13th (13:46.30). 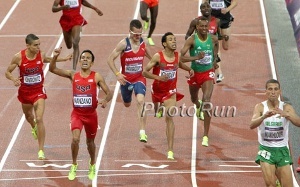 Kenyan junior Edwin Meli won the 800 in 1:45.01. 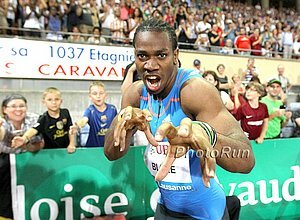 *List Of US Performances Carmelita Jeter, Ginnie Crawford, Jason Richardson, Ryan Bailey, Maggie Vessey, Allyson Felix and Reese Hoffa all won their events. 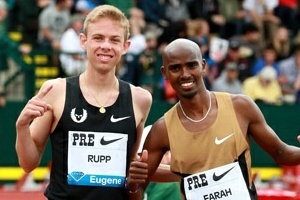 IPC Won't Punish Oscar P Over His Post-200 Blade Length Comments Why would they? Way more controversial things were said by athletes after the women's 1,500 at the Olympics. IPC Spokesman On Pistorius Issue: "Serious sport has big controversies ... This debate shows how seriously we want to be taken." Paralympic Sprinter Thinks Blades Do Give Athletes An Advantage And Oscar P Shouldn't Have Run In The Olympics We agree. Did Pistorius's Outburst Destroy His Brand? He definitely didn't help it. Dated Oscar P Interview: He's Ok With The Nickname "Blade Runner" But Not "Fastest Man On No Legs"
Kenyans Rack Up More Paralympic Distance Medals, Led By Abraham Tarbei With A WR In The T46 1,500 In the T13 1,500, Kenya's team captain Henry Kirwa failed to defend his title, but was 5th with a 3:53.55 PR. James Boit Is A Guide To Paralympic 1,500 Champ Samwel Muchai And Says Training With Him Has Changed His Life This is the perfect job for second-tier Kenyans who can't compete internationally. Kenyan Paralympians are still very fast and need to find guides who are faster. 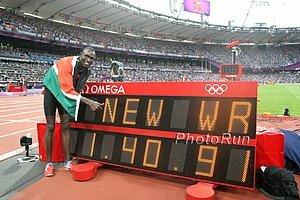 Boit has 3:44 PR (13 seconds faster than Muchai's WR) and since he led Muchai (literally) to a gold medal, he gets a $23,600 bonus. 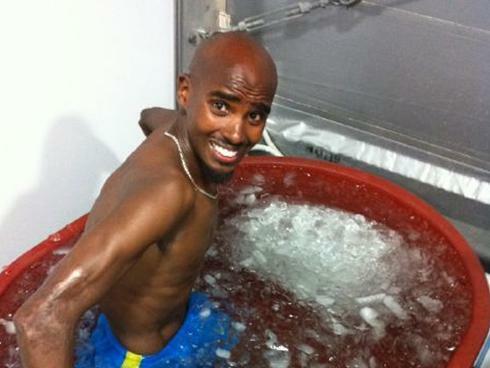 Mo Farah Shows Off His Twin Baby Girls Apparently he and his wife were worried she'd go into labor during the Games, but they had agreed to keep the news from Mo if she did. Did The Olympics Inspire You To Start Running Or Run More? Watch Out For Tendonitis Just remember RICE: rest, ice, compression & elevation. Deadline Has Passed For Disgraced Shot Putter Nazeya Ostapchuk To Appeal Her Positive Drug Test At this point, it doesn't look like she went through with an appeal, but Valerie Adams hasn't heard official word. Jamaican Blogger Argues For Why Asafa Powell Should Undergo Groin Surgery Using Tyson Gay As A Success Story Powell has previously stated that he refuses to go under the knife when it's possible it might not even help. Tilburg 10 Mile And Women's 10k: Patrick Makau Takes 3rd (45:41) In A Close Race As Pius Kiprop Wins In 45:38 Over John Mwangangi (45:40) Gladys Cherono won the 10k in 30:57 over Emily Chebet (30:58) and Joyce Chepkirui (31:10). Linet Masai was 4th. Sweden's Carolina Kluft Has Her Last Competition And Retires "It's sad, wonderful, somber, fantastically fun, and also nice." Morgan Uceny Gets A Hero's Welcome In Her Home Town "I just felt amazing and I was like, this is it, this is going to happen for me. And the next thing I know I was on the ground. When I knew it wasn't going to happen, I just reacted. I didn't think I should get up, there was no thinking at all. I was just devastated and I couldn't have moved if I wanted to. I knew it was over and I just didn't do anything about it." Oscar Pistorius Dominates to Win Final Track Gold His time was 46.68 which was a slow time for Oscar but a Paralympic record. Pistorius won by nearly three seconds and this was his first individual gold in London. *Armstrong's Agent Whines & Complains "Just the latest chapter in USADA's never-ending vendetta against Lance." Wow: Parents Of 4 X 100 Gold Medallist Tianna Madison Sue Her, Saying Their Own Daughter Has Defamed Them This isn't a case of an "absent parent" trying to cash in, as both mom and dad were in London. 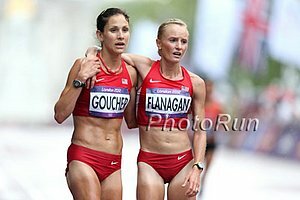 US Olympians Amy Hastings, Julie Culley, & Janet Bawcom Added To NYC Field They join the previously announced Kim Smith. Also previously announced for the men were Meb, Abdi, Hall, Hartmann, Gotcher, Arciniaga, Carlson, Bauhs and Vail. After So Many Complaints, NYC Marathon Modifies Their "No Baggage Policy" Runners now offered two options: No-Baggage "Early Exit" or checked bag. 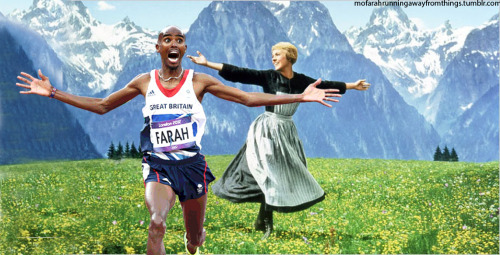 No Mo-Geb Duel: Mo Farah Drops From Great North Run Half Marathon And Will Run An Invitational 2-Mile Which Has Been Added Instead Farah says with the stress of taking care of the two newborns he hasn't got in enough training for a half marathon. Haile Gebrselassie has also dropped from the field with a knee injury. Kenyan Charles Munyeki Will Chase The $25,000 Bonus For Breaking the CR At Toronto Waterfront Marathon On Oct. 14th The record is 2:07:58 and his best is 2:07:06 from Chicago 2009. Video Interview With Bernard Lagat: As Long As He's Still Running Fast, He's Going To Keep Going Past 2013 He says he enjoys running much more than earlier in his career because all he did is train. 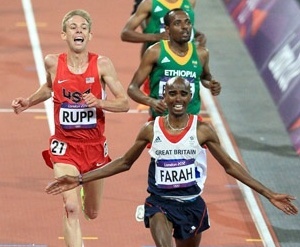 "Plus I was under the shadow of the great El G. So it doesn't matter what I do, I was going to come in second. 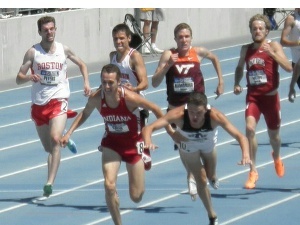 That's why I feel bad for the 800 runners now." Post-Olympics Q&A With LaShawn Merritt: "I have to get my titles back ... Ending the season without being able to compete at the Olympic Games is tough." He says he could have easily run 43s this season, but held back in early meets and "chose not to." Craig Mottram Says He's Done With The Track And Moving Up To The Marathon He'd like to debut at London or Boston in the spring. 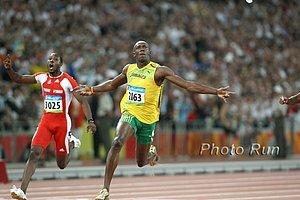 Usain Bolt Might Play Manchester United Charity Game Next Summer Unlikely this happens as it's on June 3rd, which is right before some key DL meets and the August World Championships. With Sheila Reid Gone, What Are Jordan Hasay's Chances At Finally Winning The Women's NCAA XC Individual Title? She's the favorite as she barely lost to Reid last year, but she could face challenges from others such as Abbey D'Agostino, Katie Flood and Natosha Rogers. Teg On New Haven 20k: "I was out there being a hunter and it was fun to be in the fight in a championship race." Olympic TJ Champ Christian Taylor Talks About His London Experience And Almost Not Even Advancing Past The First Round He fouled the first two so there was a lot of pressure on his 3rd jump. Taylor: "Of course I was nervous, If I fouled the next one my Olympic Games were over. If I didn't jump far enough, the journey was over. But I wasn't going to let that happen." 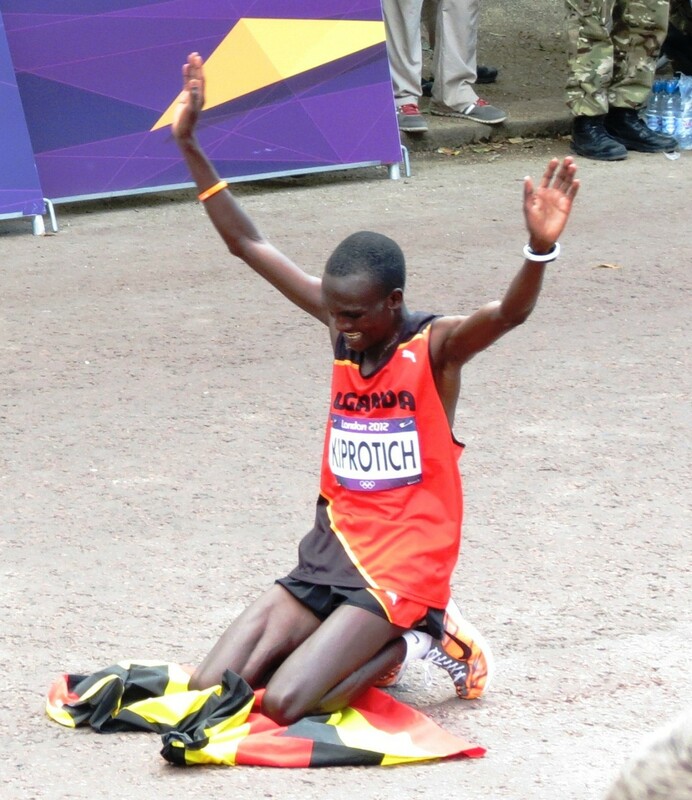 Frankfurt Marathon Adds Four 2:06 And Under Runners To Field To Challenge Patrick Makau In His WR Attempt Yemane Tsegay (who ran 2:04:48 in Rotterdam), Albert Matebor (2:05:25), Bazu Worku (2:05:25) and Gilbert Kirwa (2:06:14) have all been added to the field. He's Back: Adam Goucher To Compete In ElliptiGo World Championships While coming back from knee injury, Goucher is enjoying the elliptigo, saying, "I fly, dude. I ride fast, I ride hard, and have fun. I ride all over Portland, pretty much." And Hopefully Soon Too Will Be Lukas V: Five Weeks After Bike Crash, Lukas Verzbicas Walks Out Of Colorado Hospital With Hopes Of Still Pursuing A Career As An Elite Triathlete Verzbicas: "I could have been a paraplegic or even worse. They told me I could have passed away, so I feel very lucky that I'm still here and that I'm recovering so fast." At Least He Still Has An Olympic Medal: Jeff Demps On Injured Reserve, Out For The Season He came up limping in the fourth quarter of the Patriots preseason finale. Gary Cohen Extensive Interview With Joe Newton, The Coach At York High School, Who Has Led The Team To 27 Illinois State XC Titles Newton gives insight into the influences and training philosophies he uses with his runners. Lisa Uhl Reflects On Her Olympic Experience And Says She's Taking A Vacation From Running Until Fall She wants to "just forget about being a runner for a while and be a normal person for a little bit." September 16th: Olympic Champ Tiki Gelana Against World Champ Edna Kiplagat In Newcastle Half Marathon Britain's Jo Pavey 2010 Commonwealths winner Irene Jerotich also in field. Oscar P Apologises For The Timing Of His Outburst Against Oliveira, But Could Still Be Hit With A Punishment From The IPC However, the IPC has agreed to sit down with him and talk about the blade length issue. Alan Oliveira Confirms That He's Improved By About A Second Since Switching To The Longer Blades He increased his height from 1.76m to 1.81m just three weeks ago. Under IPC rules, he could go up to 1.85m. So as an disabled athlete you can essentially change your height to find the optimum stride length. IPC Rules Would Let Oscar P Increase His Blades By Another 9cm, But He Doesn't Because Then He Wouldn't Be Legal To Compete In Able-Bodied Races Pistorius races at a height of 184cm, but he could go up to 193cm under the IPC rules. College Professor Uses "Conservation Of Angular Momentum" To Explain Why He Thinks Oscar P Wasn't At A Disadvantage Prof. Steve Haake: "[Pistorius] has opened a can of worms. If he is saying, 'If you lengthen your legs you are at an advantage,' then he blows his argument out of the water that he gains no advantage over able-bodied athletes by using prosthetics. He is in a difficult place and can't have it both ways." Alan Oliveira "Disappointed" By Oscar Pistorius's Claims "I was let down by how much he wanted to take away from me the merit for winning gold ... He was hotheaded." American Armless Archer First Learned To Shoot So He Could Help Hunt For His Family And "put food in the freezer." Samwel Mushai Set A Paralympics Record And Won Kenya's First Gold Medal Of This Paralympics In The 1,500m-T11 Henry Kirwa took a bronze in the 5,000m T12 (visually impaired) category. Inspiring Athlete: Kenyan Paralympic Captain Henry Kirwa Will Try To Defend His Title In The 1,500-T13 He won 3 golds in Beijing (10,000m T13, 5,000m T13, and 1,500 T13), but can only defend the 1,500, since the IPC no longer offers the 5k/10k T13. US Women Win World Title (Results Only) Melody Fairchild, the former Foot Locker champ, was on the US team. IPC Reaction: "All blades are measured and Oliveira's passed the test. There's been no infringement of the rules." Pistorius' Accusation Doesn't Have A Leg To Stand On: The Science Of Sport Assesses Pistorius' Argument And Says It's "Pretty Baseless" He explains that in truth, Pistorius has the longer stride anyway and there are a lot more factors involved than pure stride length. The International Paralympic Committee Has Accused London 2012 Of Scaling Back On Drug Testing At The Games To Save Money The number tested at the Paralympics is a much smaller percentage than that tested at the Olympics. Some Paralympians Complain About Media Referring To Them As "Inspirational" They say don't want to be patronized, but how is it patronizing to praise them for what they've had to overcome? UK Cyclist Becomes Only Second Person In History To Win Both An Olympic And A Paralympic Medal He was a "pilot" on a tandem bike for a visually-impaired athlete, which are the only able-bodied athletes that can win medals. Matt Tegenkamp Running US 20km On Monday In Stratton Faxon New Haven 20k- Race Will Be Free On Net At 8:40am ET USATF lists the contenders as Sean Quigley, Christo Landry, Joseph Chirlee, Andrew Carlson and James Carney on the men's side and Stephanie Rothstein, Katie McGregor, Maegan Krifchin, Renee Metivier-Baillee and Alisha Williams for the women. *Full Elite Entries *MB: Chad Hall Making 20km Debut - Anyone think that the Foot Locker Champ talent will come out? Matt Tegenkamp: "I think at the point I am at in my career I am not naïve enough to think that my track career is going to go on forever and ever." "It is amazing that it is a two year build-up and it is absolutely over in the blink of an eye. The adjustment back from London was probably the most difficult I've ever had in my career." *MB: Tegenkamp to retire??? Diego Estrada Says That He Lets All The "Haters" And Critics Get To Him And He Went Into London Emotionally Drained He said immediately after the Olympics, he considered quitting the sport completely, but is back training now. Former Oregon Project Coach Steve Magness Named University Of Houston Assistant Cross-Country Coach He's also still coaching some pros, such as Jackie Areson, Tommy Schmitz and Sara Hall. US Trail 10k Champ David Roche's Post-Race Report In an email, David recently partially credited Wejo's "Why I Sucked in College" article as helping him in with his running career. Man Fails Miserably In Marathon-In-A-Suit WR Attempt He had a 3:36 PR and wanted to break the 3:24:46WR ... but he finished in 5:06:09, throwing up six times and drinking five beers (in that order). Interactive Political Marathon Battle: Bush V. Gore V. Ryan V. Palin And More ... Who Wins? Paul Ryan Time Calculator: How Fast Could You Run If You Were Paul Ryan? *Sabrina Yohannes Interviews Mohammed Aman Who Won His Second 800 In 3 Days With A 1:43.62 He said he wanted another 1:42, but the pacemaker was too slow for the first lap. On The Boards: GERMAN with the PB! 3:34.60 in Berlin! Ireland's Independent On Armstrong: "A hero to many, but a cheat is still a cheat." Impressive: GB's Richard Whitehead Wins Paralympic T42 200 Gold Medal He's a pretty impressive athlete, as he's a double above-the-knee amputee and has the marathon WR of 2:42:54. He only converted to the sprints because the Paralympics doesn't have a marathon for his disability category. Djibouti's Only Paralympic Athlete Gets A Standing Ovation From The 80,000 Person Crowd As The One-Armed And Injured Runner Struggled To Finish He finished the 1,500 in 11:23; over 7 minutes behind the winner.